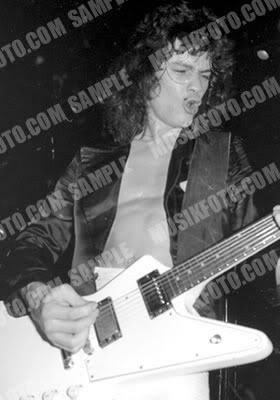 I've posted the evolution of my 1975 Ibanez Destroyer build on ClassicVanHalen.com years ago. 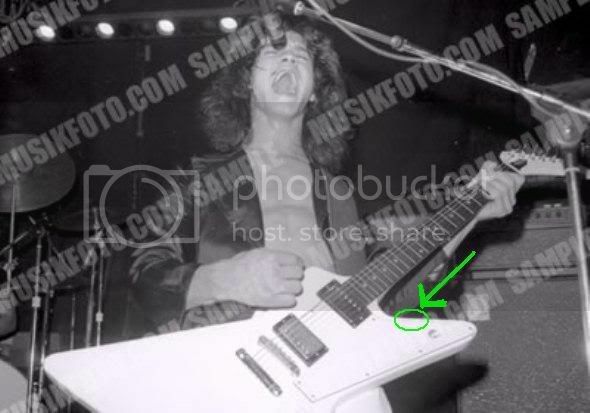 I got it in May of 2010 and I did a lot of research on Ed's original Ibanez Destroyer to try to get as many details as I could to build mine in the image of Ed's guitar as it likely existed during the recording of Van Halen and as it certainly existed in the club days from 1975-1977. First, some background on Ed's Destroyer and how he got it originally. 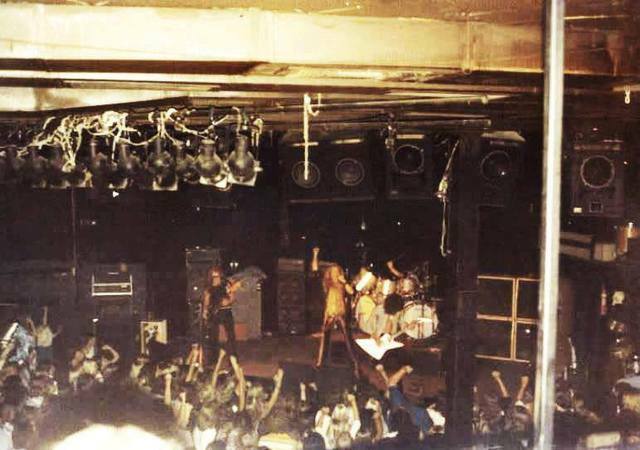 Apparently, according to Doug Anderson (the guy who was around the band in the early days and who maintains the 'Van Halen Museum' in his guitar shop in Pasadena) Chris Holmes and Eddie bought their Ibanez Destroyers at the same shop at the same time. He said they were "first ones that came off the boat" from Japan. Last edited by garbeaj; 08.25.14 at 09:31 AM. These guitars were made of Japanese "Sen" which is supposedly a species of bamboo, but is often referred to as "Sen Ash". 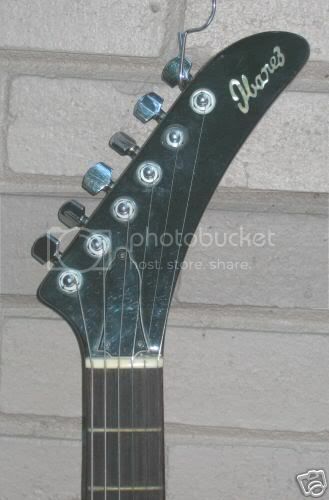 Ibanez used to advertise that these guitars were made of "Korina" and both Ed and Chris thought that this was true. In fact, "Korina" is only the name of the amber colored finish. 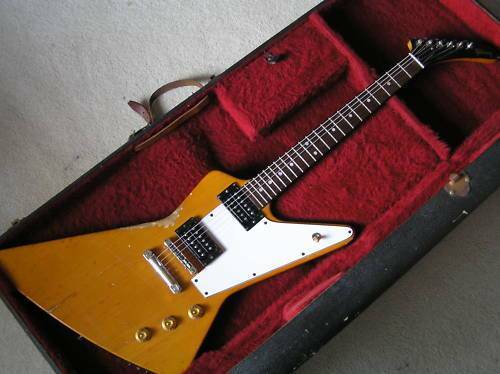 Gibson made the original Explorers from African Limba, which is supposed to be name of the actual wood that the real "Korina" Gibson Explorers and 1958 Flying V's were made of. 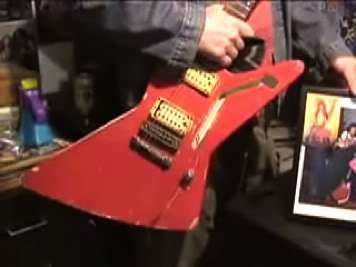 So-Ed's Ibanez Destroyer and the Chris Holmes Destroyer were originally finished in an amber epoxy finish to look like the original Gibson Explorers. This finish has a similar composition to rubber cement-also amber colored. This finish was very susceptible to being chipped...many examples of these so called "lawsuit" Ibanez guitars are chipped everywhere. Last edited by garbeaj; 08.18.14 at 01:25 PM. Last edited by garbeaj; 08.18.14 at 01:50 PM. That guitar is to me, the best sounding one he's ever played. I imagine that had he not cut the chunk out that that guitar would have become his regular everyday guitar. I know he loved it. A friend of mine just got a hand me down tobacco burst Mann Les Paul copy. Mann were rebranded for some markets, and were the same company as Ibanez, and his is Sen. Make no mistake, it still sounds great. I put in some Bill Lawrence pickups in his. You can see once you break into the guitar what Garbeaj is talking about with it being a species of bamboo. It's got that very similar rounded end grain. 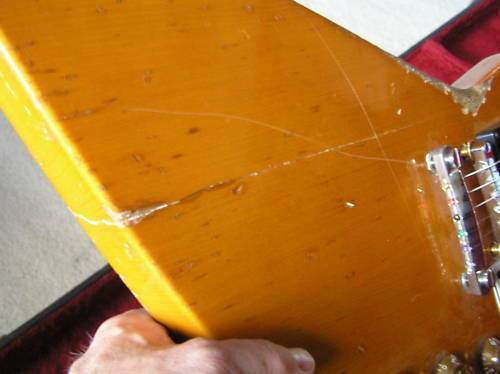 Yeah...The whole Korina thing....It's got a lot of stigma and myth behind it.Like you said...."Korina" was the color, not the wood, but because that amber was associated with those guitars almost exclusively, it all got lumped together. Real white Limba like what was in Ed's original Flying V which was used on Hot For Teacher for example, is an amazing tone wood. It has a very similar grain to mahogany, but it is lightweight, and very resonant. Ed's Destroyer was a great sounding guitar too, and I truly believe there too....the resonant qualities of the sen, as well as the mass of the guitar have a huge impact on tone and sustain. My buddy's LP copy is no exception in the tone department either. It sounds huge. Even better with the BL pickups. Your story is very interesting. However I must take issue and give you a tip. You wrote, "The knobs that he chose are unusual and this new shot gives me the best detail of these knobs." I can solve your mystery, it's easy. I laughed about his knobs whenever I saw him play in the 70's. I personally asked him backstage at the Whisky A GoGo in 1976. 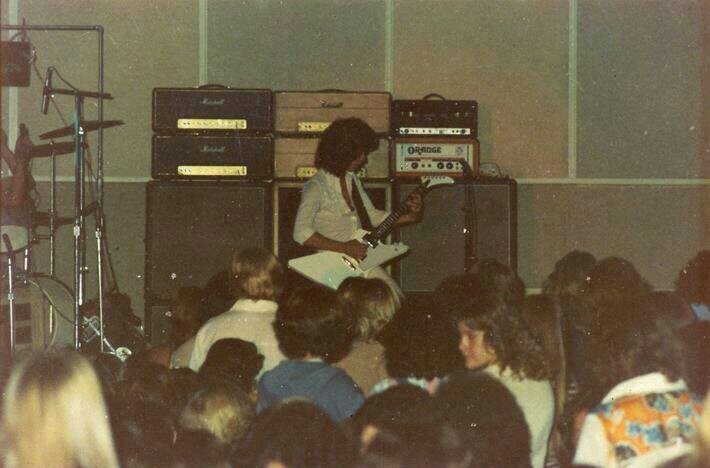 He traded the knobs off of his Strat, put them on the Destroyer, took the Destroyer knobs and put them on his Strat. He wanted to make the guitars look different than normal. Plus he played the Strat on a song where he needed the larger Gibson type barrel knobs to do the "volume/down - volume/up with his pinky finger" by rolling the knob. The Destroyer has standard Strat knobs. I am 200 percent sure of this. I am 57 years old and I've been collecting, buying, and selling old vintage guitars since 1966. I specialize in 60's Gibson Firebirds, and most of the Gibson 50's/60's vintage electrics, 50's-60's Fender, all 60's VOX eqpt, 60's-70's Rickenbackers. And I can easily verify the Destroyer knobs. You're gonna love this. 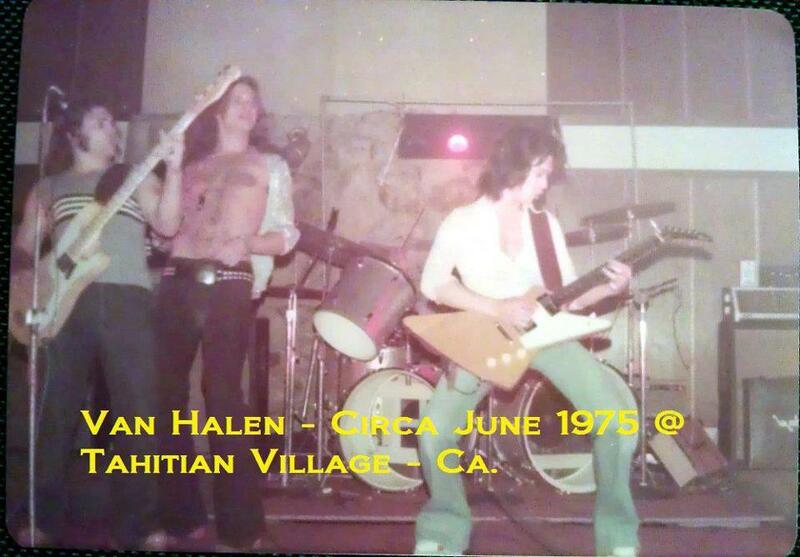 A few weeks ago I found 2 rolls of lost film - COLOR Van Halen at the Starwood January 1977. There are 5 color shots of Eddie with the Destroyer. Super color, clear sharp, full details of the Destroyer close up, no cropping. 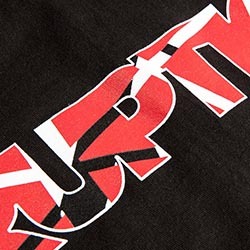 You must have these for your replica guitar. I hope this info helps. 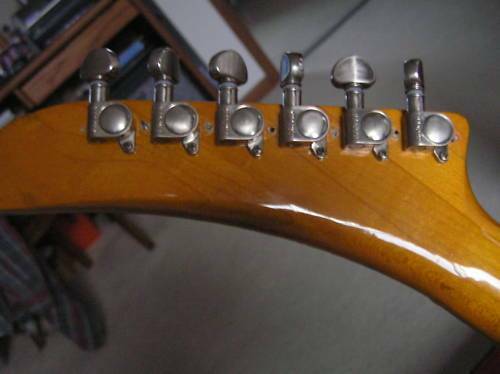 It's very clear in the photos, Strat knobs. Last edited by garbeaj; 08.25.14 at 09:26 AM. Now this series of prints is readily available from Marvin. At the time I encouraged him to approach Guitar World and other publications with this series of photos and they appeared about a year later in Guitar World and on the VanHalenNewsDesk. 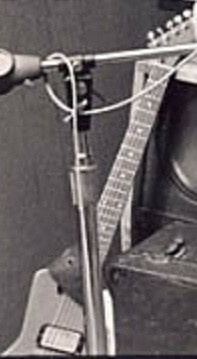 These pictures were the first absolute proof that the guitar was painted white (not silver as many had speculated) and they were proof of mnay of the mods that Ed made to the guitar from it's stock condition...the strat knobs with the Gibson style metal arrow pointers, the gold metric Ibanez bridge that replaced the original chrome bridge. You can see that the gold finished bridge stayed on the guitar through the recording of the first album and at least through the making of these videos. Last edited by garbeaj; 08.25.14 at 09:20 AM. 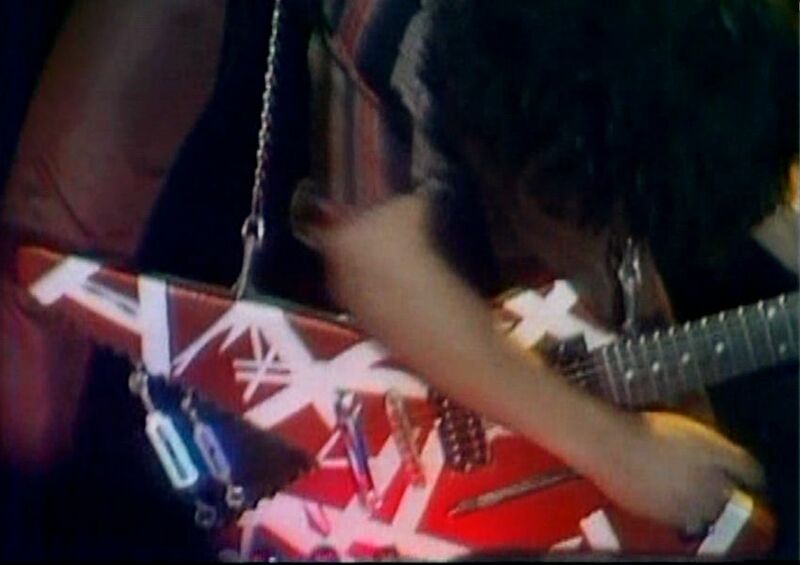 Speculation abounds on what pickups were in the Ibanez Destroyer at the time of the recording of the album. These pictures point to a strong possibility that it was stock Super 70s with the pickup covers remaining. 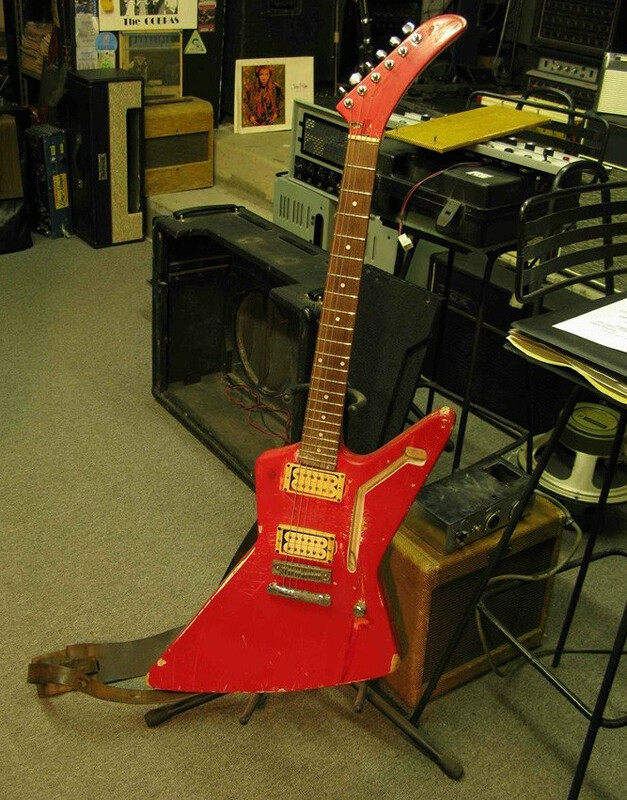 After Ed made the "Shark" mod, he tried many different pickups. 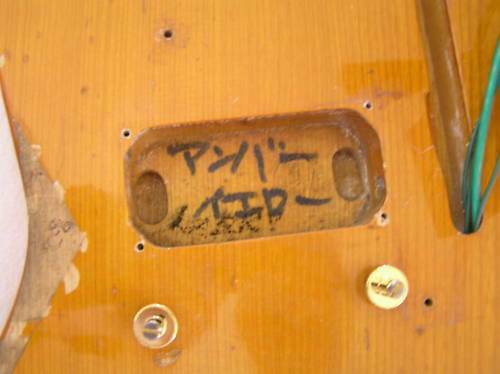 I don't want to get into a speculation free-for-all about what pickups were used in this thread, but these pics did prove that P.A.F. style pickups with the nickel pickup covers were on the guitar during this white phase. Last edited by garbeaj; 08.25.14 at 09:33 AM. 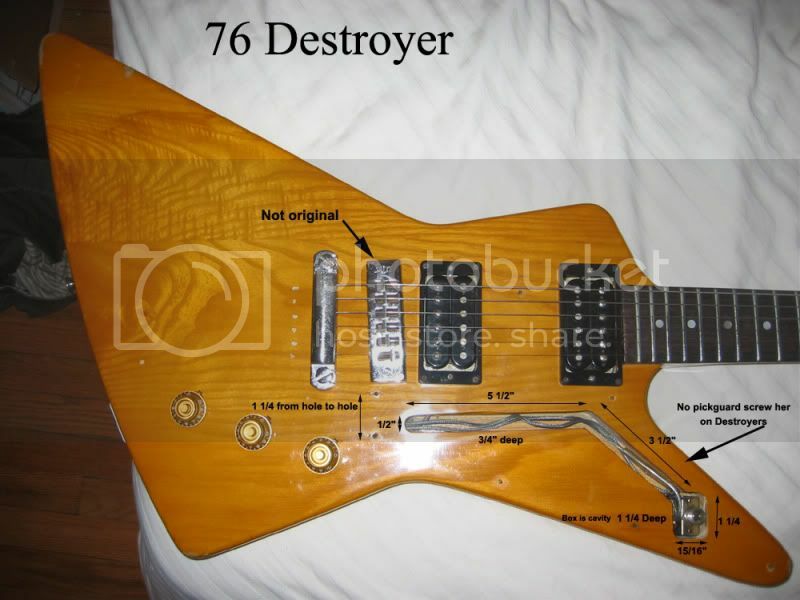 I've been looking for an original destroyer but they're really hard to find. Especially the one like he had. 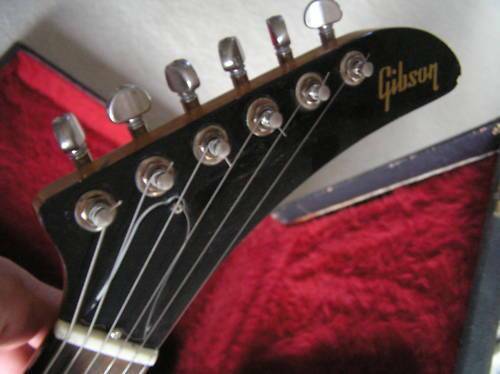 Gibson sued them to get them to change it and they weren't the same. I tried one like Phil Collen used and it wasn't the same. The super 70's make that guitar. Last edited by Double Down; 09.25.16 at 11:12 PM. 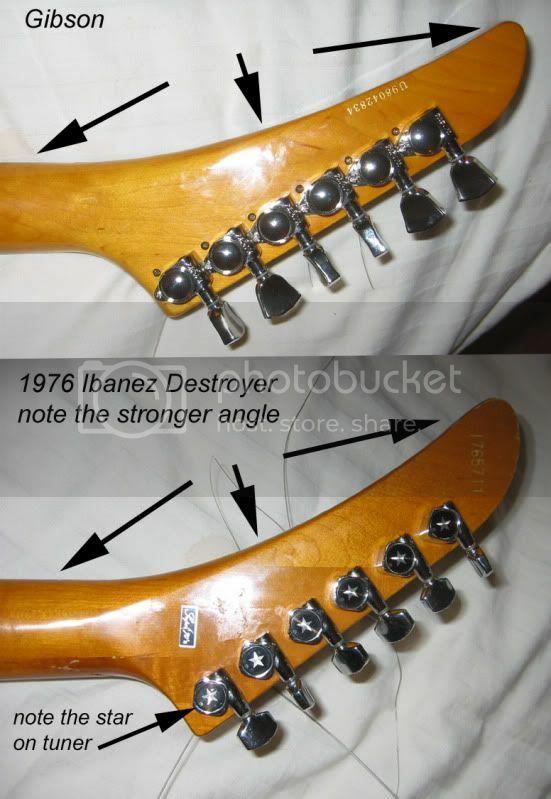 I was lucky enough to find an original 1975-1976 Ibanez Destroyer in rough shape on eBay for $750.